The fire ant is a wingless member of the order Hymenoptera, which includes wasps and bees. It is a potentially lethal environmental hazard in the United States, infesting more than 310 million acres of land. Fire ants are resistant to control efforts and can overwhelm an environment. They damage farm equipment, electrical systems, irrigation systems, and land. They build mounds in sunny, open areas (eg, lawns, playgrounds, parks, golf courses) and aggressively attack anyone who disrupts their mound. See the images below. Red imported fire ant worker. From http://fireant.tamu.edu. Reproduced with permission from B.M. Drees, Texas Imported Fire Ant Project Coordinator, Texas A&M University, College Station, Texas. 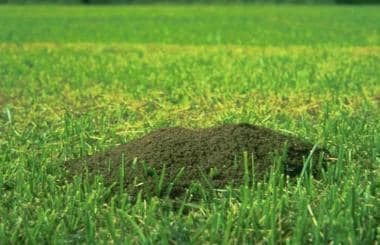 Fire ant mound in lawn. From http://fireant.tamu.edu. Reproduced with permission from B.M. Drees, Texas Imported Fire Ant Project Coordinator, Texas A&M University, College Station, Texas. Fire ants are thought to have arrived in the United States between 1918 and the 1930s from South America by ships that docked in Mobile, Alabama. They are now found throughout the Southeast and are migrating rapidly. One contributing factor to this expansion is progressive urbanization in the United States, which creates the type of disturbed habitat that the fire ants prefer. Their mobility and ability to establish colonies in diverse habitats makes the detection of new infestations difficult. Sometimes, colonies exist several years before detection. The fire ant uses its mandibles to grasp its victim. It arches its body and drives an abdominal stinger into the skin to release venom. If not quickly removed, it then pivots around its mandibles and inflicts further stings in a circular pattern. 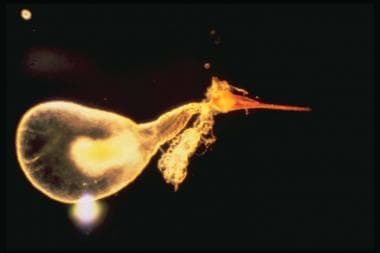 The stinger is a modified ovipositor that consists of a dorsal stylet and two ventrolateral lancets. These structures surround the venom canal, which connects to the venom sac. A pair of coiled glands produces the venom that discharges into the venom sac. See the image below. Venom sac and stinger of a fire ant. From http://fireant.tamu.edu. Reproduced with permission from B.M. Drees, Texas Imported Fire Ant Project Coordinator, Texas A&M University, College Station, Texas. Fire ant venom differs from bee and wasp venom, which are mostly proteinaceous solutions. About 95% of fire ant venom is water-insoluble, is nonproteinaceous, and contains dialkylpiperidine hemolytic factors. These hemolytic factors induce the release of histamine and other vasoactive amines from mast cells, resulting in a sterile pustule at the sting site. These alkaloids are not immunogenic, but their toxicity to the skin is believed to cause the pustules to form. The venom also contains several allergenic proteins, measuring about 1.5% by dry weight. Four major allergenic proteins exist; Soli 1-4 induce immunoglobulin E (IgE) responses, including anaphylaxis, in patients who are allergic. Antigenic similarity exists between these proteins and bee and wasp venoms. Many patients have venom-specific IgE-mediated wheal and flare reactions that develop over hours into pruritic edematous, indurated, and erythematous lesions that persist for up to 72 hours. These lesions may involve an entire extremity. They histologically resemble late-phase mast cell–dependent reactions and show an infiltrate of eosinophils, neutrophils, and fibrin deposition. Large, local reactions rarely can cause edematous tissue compression, leading to vascular compromise of an extremity. Because most fire ant stings are not severe enough to cause the victim to seek medical attention, estimating the frequency of stings is difficult; however, annually, more than one half of the population in endemic areas is stung, and the incidence appears to be increasing. 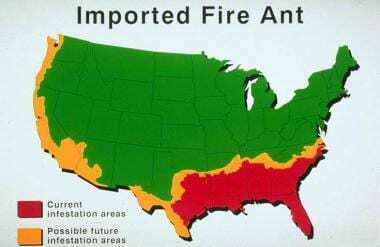 Imported fire ant national distribution map. From http://fireant.tamu.edu. Reproduced with permission from B.M. Drees, Texas Imported Fire Ant Project Coordinator, Texas A&M University, College Station, Texas. Fire ant stings may occur in people of any race. No race has been shown to have an increased risk of being stung or to have a higher predisposition to complications. Fire ants sting both males and females without discrimination. Fire ants sting people of all ages, but children are overrepresented, probably because of greater environmental exposure. Minor reactions have an excellent prognosis. Severe reactions have an excellent prognosis with early and appropriate treatment. However, fire ants are becoming an increasingly important public health concern in the United States. More than 80 fatalities have been reported from fire ant-induced anaphylaxis. For patient education resources, see the patient education articles Insect Bites, Allergy: Insect Sting, and Severe Allergic Reaction (Anaphylactic Shock). Kemp SF, deShazo RD, Moffitt JE, Williams DF, Buhner WA. Expanding habitat of the imported fire ant (Solenopsis invicta): a public health concern. J Allergy Clin Immunol. 2000 Apr. 105(4):683-91. [Medline]. Hoffman DR. Ant venoms. Curr Opin Allergy Clin Immunol. 2010 Aug. 10(4):342-6. [Medline]. Potiwat R, Sitcharungsi R. Ant allergens and hypersensitivity reactions in response to ant stings. Asian Pac J Allergy Immunol. 2015 Dec. 33 (4):267-75. [Medline]. Tankersley MS, Ledford DK. Stinging insect allergy: state of the art 2015. J Allergy Clin Immunol Pract. 2015 May-Jun. 3 (3):315-22; quiz 323. [Medline]. Srisong H, Daduang S, Lopata AL. Current advances in ant venom proteins causing hypersensitivity reactions in the Asia-Pacific region. Mol Immunol. 2016 Jan. 69:24-32. [Medline]. Haddad Junior V, Larsson CE. Anaphylaxis caused by stings from the Solenopsis invicta, lava-pés ant or red imported fire ant. An Bras Dermatol. 2015 May-Jun. 90 (3 Suppl 1):22-5. [Medline]. More DR, Kohlmeier RE, Hoffman DR. Fatal anaphylaxis to indoor native fire ant stings in an infant. Am J Forensic Med Pathol. 2008 Mar. 29(1):62-3. [Medline]. Smith KE, Fenske NA. Cutaneous manifestations of alcohol abuse. J Am Acad Dermatol. 2000 Jul. 43(1 Pt 1):1-16; quiz 16-8. [Medline]. Lee YC, Wang JS, Shiang JC, Tsai MK, Deng KT, Chang MY. Haemolytic uremic syndrome following fire ant bites. BMC Nephrol. 2014. 15:5. [Medline]. Ford JL, Dolen WK, Feger TA, Hoffman DR, Stafford CT. Evaluation of an in vitro assay for fire ant venom-specific IgE. J Allergy Clin Immunol. 1997 Sep. 100(3):425-7. [Medline]. La Shell MS, Calabria CW, Quinn JM. Imported fire ant field reaction and immunotherapy safety characteristics: the IFACS study. J Allergy Clin Immunol. 2010 Jun. 125(6):1294-9. [Medline]. deShazo RD. My journey to the ants. Trans Am Clin Climatol Assoc. 2009. 120:85-95. [Medline]. [Full Text]. [Guideline] Moffitt JE, Golden DB, Reisman RE, Lee R, Nicklas R, Freeman T, et al. Stinging insect hypersensitivity: a practice parameter update. J Allergy Clin Immunol. 2004 Oct. 114(4):869-86. [Medline]. [Full Text]. Jerrard DA. ED management of insect stings. Am J Emerg Med. 1996 Jul. 14(4):429-33. [Medline]. Williams DF, deShazo RD. 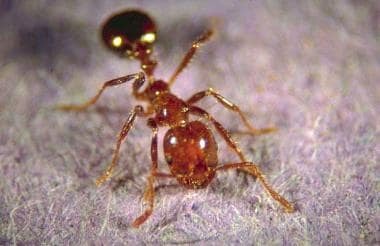 Biological control of fire ants: an update on new techniques. Ann Allergy Asthma Immunol. 2004 Jul. 93(1):15-22. [Medline]. Burroughs R, Elston DM. What's eating you? Fire ants. Cutis. 2005 Feb. 75(2):85-9. [Medline]. Fire ant worker biting and stinging. From http://fireant.tamu.edu. Reproduced with permission from B.M. Drees, Texas Imported Fire Ant Project Coordinator, Texas A&M University, College Station, Texas. Pustules and blisters formed following fire ant stings on the arm. From http://fireant.tamu.edu. Reproduced with permission from B.M. Drees, Texas Imported Fire Ant Project Coordinator, Texas A&M University, College Station, Texas. Pustules and blisters formed following fire ant stings on the hand. From http://fireant.tamu.edu. Reproduced with permission from B.M. Drees, Texas Imported Fire Ant Project Coordinator, Texas A&M University, College Station, Texas. Fire ant bites on the foot.